No difference in the springs from "old" to "new." The differences is with the rear shocks only. PMs sent on Green Spring fitament etc. 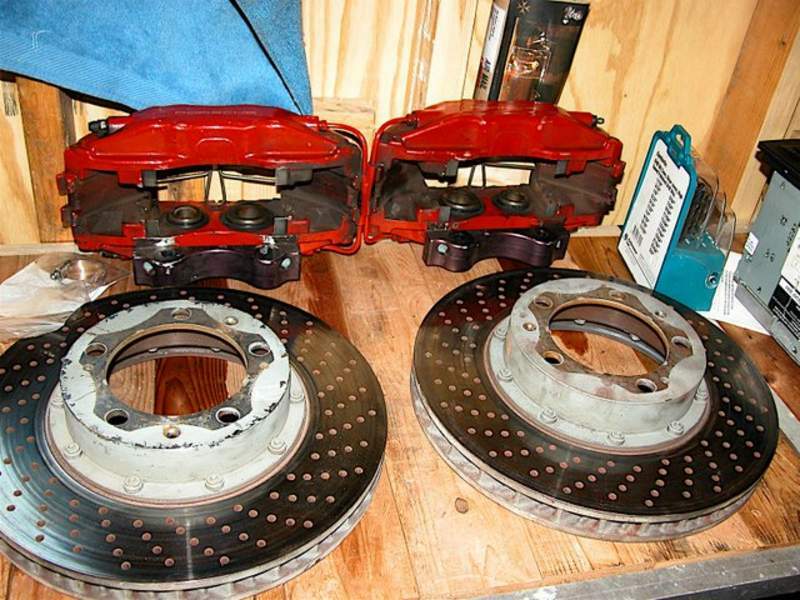 I have a set of front 993TT aka "Big Red" brake calipers and rotors, along with adaptors that would fit the 964 narrow body cars. The calipers were rebuilt last year and the rotors are also new from last year. The rotors are in great condition with no lip and very little use. I'm looking for $1200 for the brakes or $1000 without the adaptors. For shipping, figure a 60 lb box from ZIP 10002 via UPS Ground. hi, would you consider shipping to europe? I have a set of pristine 16" D92's (cup 1's) with center caps for sale. I'm looking for a set of Cup 1 wheels. What widths and offsets are they? Can you send me some photos? I am in need of a single cylinder head for a 1992 964 3.6l. Preferably one with the updated head gasket, but I could have this machined in if needed. I will be having the seats redone so good used condition ok. Still have 17" cup 1 knock-offs with Michelin Pilot sport cups for sale as well as two 4 piston brake calipers (see previous post). Thanks! I have a stock air box cover and undertray. I am in North Jersey so it would make for easy pick up. Make me an offer if your interested. I have the stock chip from a 91-964. PM me with an offer. Looking to purchase a set of four 17" Cup I wheels in nice condition. Please let me know if you have a set. Last edited by David K.; 11-18-2007 at 03:13 PM.